What do you do when you’ve poured your heart and soul into creating something, only for a national newspaper to publish it all online and insult it? This I wondered to myself as a non-law undergraduate, certain that something had to be done about it but not at all sure what. As part of Oxford University’s Raise And Give (RAG) society I had project managed the creation of a charity naked calendar featuring 75 of the university’s top athletes. This was a particular passion project for me, as although it was a traditional idea for a charity project, I anticipated that it would increase RAG’s profile and broaden its market to tourists. I threw myself into the unprecedented logistical and creative challenges that a university-wide calendar presented. Once the calendar was ready, we at RAG checked with a small selection of the athletes featured if they’d be happy to have their photos licensed out for media coverage and consent was given. We then sent out a press release to various news organisations, but were shocked to see the Mail Online publish an article that included every single photo blown up for the world to see. And as you might expect, the comments section was an unpleasant sight for anyone involved in the project, featuring quips like “Clearly it’s not possible to have brains AND looks,” and “This has put me off my late breakfast”. That day, a selection of the photos also appeared in the Daily Mail. Soon I heard a friend say that now they’d seen the pictures there was no point in buying the calendar. At the same time I had lacrosse players draw my attention to the fact that journalist Jan Moir, in her own column, had singled out their photo just to call the athletes “unoriginal” and tell them to “put [their] pants back on”. Comments like this added insult to the injury, obviously, of having naked photos published online, in perpetuity, without the subjects’ consent. At that point we didn’t even know how Mail Online had obtained the photos, as no one at our end had sent them to anyone. It turned out a local news agency had produced copies of the photos by navigating to a preview of the calendar’s back page on the Oxford University Shop website. I understand they screen-grabbed the thumbnail images, expanded them and enhanced them before selling them on to various news organisations, including Associated Newspapers (owners of the Daily Mail and Mail Online). 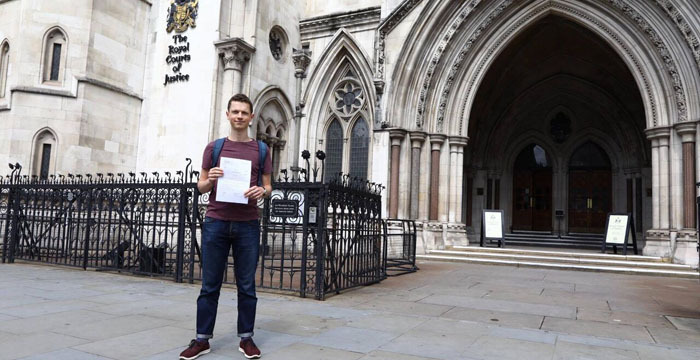 At first the calendar’s photographer, a modern languages undergraduate, was very proactive in sourcing what free legal advice he could, and he managed to have a law firm write letters to the news agency and the Daily Mail informing them that they didn’t have (and never had) permission to use the photos. There was resistance from both parties. The Daily Mail claimed it had bought the images in good faith, but after a few exchanges it became apparent that no acceptable settlement could be reached without some form of legal action. I spoke with a few law students about what to do, and most of them shrugged and said it was pointless trying anything against a big company. Even the Oxford University Student Union (OUSU), which oversees RAG and the Oxford student body in general, didn’t seem able to help. Undeterred I eventually managed to meet an intellectual property lecturer, who told me all I wanted to hear: that something could be done. She directed me towards the Intellectual Property Enterprise Court (small claims track), which was apparently created just for this kind of situation. Fast forward to after I graduated and managed to get an actual job at an advertising agency, I hadn’t forgotten the case, and managed to attend a free legal clinic at Queen Mary University in East London. I spent 45 minutes explaining the case to two students and, to my joy, the lawyer supervising, who was from Simmons & Simmons, later offered to take on the case pro bono. All this required, for their pro bono policy, was for a charitable organisation to be the client. Sadly my presumption that OUSU would agree to this was misplaced, as its trustees decided against getting involved. So, it was back to the drawing board. With the pro bono engagement fallen through, I undertook to sue Associated Newspapers and the news agency myself. Fortunately a supervising associate at Simmons & Simmons was willing to lend some informal advice along the way. I collaborated with a friend to learn the difference between a claim form and the particulars of claim and then write them up. I eventually plucked up the courage to issue the claim at court, only to learn that there are separate fees for money and non-money claims, so if I wanted a financial settlement and injunction (i.e. have the photos taken down) then I’d have to pay an extra £308. Given that this was my own money and I had to be prepared to never see it again, I decided to go away again, change the claim form and remove the request for an injunction. I figured that if Associated Newspapers were compelled to make a payment, they would probably take down the photos too, to avoid further action. It turned out I was right. Before I knew it, I had the news agency on the phone offering a settlement, while Associated Newspapers’ lawyers at RPC wrote to me announcing they would defend the case. I then received a long email from Associated Newspapers’ group legal advisor, with the managing editor in copy, attempting to poke holes in my claim and asking what, to me, were irrelevant questions about my level of legal experience. I received a paltry offer of £630 plus half the court fee. In my response I said I’d agree to settle for £5,000. At that point I was particularly grateful for the reassurance I received from the solicitor at Simmons & Simmons that there were various aspects of Associated Newspapers’ response that I could ignore, although the actual writing and negotiation strategy was left to me. Fortunately Associated Newspapers accepted £5,000 plus fees. I could have demanded more and risked the case dragging on for longer, but inspired by Deal Or No Deal contestants who needlessly overcook it, I decided to take my £5,000 and get out. Associated Newspapers was then keen for me to discontinue the case, which could have exposed me to liability for their legal costs; however, I pulled out a seven-day trial of Thomson Reuters Practical Law to learn about consent orders and then drafted a Tomlin Order. Once sealed, this would protect me from costs and keep the case alive in the event of repeat infringement. It would also allow me to keep the news agency’s settlement amount confidential from the court, which I offered as part of our negotiation. Once I received the money, I contacted the four student-elected charities that the calendar was created for, offering an equal share in the total settlement received. Incidentally one charity never responded, so I opted to donate instead to Streets Ahead Rwanda, a brilliant charity I’ve been personally involved in fundraising for. Overall there are several lessons I learned from this, including that no matter how legally straight-forward a claim might seem, litigation always involves a significant amount of uncertainty. At the same time, I learned that part of the thrill of litigation is never quite knowing what your adversary will do next. The final lesson is to furnish your website with an email that works, as you never know what nice surprise might come your way. Louis Geary graduated from Oxford University with a degree in Psychology and Philosophy, and is now an innovation consultant at London and Dublin-based agency jump! Innovation. OUSU were always self-important and very few of the student body felt represented by them/knew who they were at all, but to shy away from defending naked students whose images were stolen when they tried to support a charity is really low. Stop kicking off referendums over whether students should wear gowns and actually protect them when you are specifically well placed to do so, though more by accident than design. These student have no future career in law. Well done lad, always good to see those jokers at the Daily Mail get their arses handed to them (slightly ironic given the whole thing started with someone handing them arses). Sounds like a risk based nuisance offer. RPC’s costs would have been above the pleaded damages do not commercially sensible to defend. Great stuff and credit to the writer for getting one over on the man. I dare say you are wasted in advertising! Surprised that the newspaper didn’t insist on the terms of the settlement agreement being confidential. They may well have been, but this chap’s 7 day trial to Practical Law had run out by then, so he didn’t consult it before posting this article. Wasn’t this the point of the Tomlin order he drafted? Wrong. An Order cannot contain something that a court cannot order (a settlement of future claims for example), a Tomlin order cannot contain things that only a Court can order (an injunction) but damages can be both ordered and contractually agreed, and so could be in an order or a contextual schedule. The only LC article where I read every single word. Hats off to this chap! An actually interesting article for once. Inspirational story. We let the tabloids get away with too much. Wholesome news story for once. Congrats, Louis! @LC: This is better than that rehashed nonsense about retention rates, where all the new and relevant information can be found in an article’s title. I would be careful about publishing settlement figures that were offered to you in a genuine attempt to settle the case – that’s privileged information and shouldn’t be disclosed even after the close of the case (look up “Without Prejudice privilege”). Privilege can only be waived with the consent of both parties. Good story, and well done. But he’s a pretty untypical litigant in person, with his legal connections and research skills and nous. They’re normally crazy ranting “freeman on the land” types. Certainly stuff that helps, but being offered “pro bono” support by a lawyer, even though that offer fell through when OUSU didn’t want to get involved, was maybe the critical encouragement. Yes, a lawyer might do that for publicity, but would taking on a no-hope case be good publicity for a lawyer? Well done and kudos for sticking with pursuing the case in spite of such obstacles all round! Well done, Louis. Good for you and glad to see you doing well. I’ve got a nice bottom, haven’t I? Wow good job, have you rethought a career in litigation. ! The daily mail posts such drivel. It normally takes mere seconds in google to disprove their stories when my friends share their artcles. I’m quite shocked your fellow law students said “don’t bother”. Most law students I know would rear for a fight like that. They obviously won’t be good lawyers. My only bone to pick is the measly sum settled for. You should have told them $5000per student for emotional damages, +costs for all your time, + lost income from calenders etc. haha. There is no basis for the further heads of damages you mention, other than £19 per hour for costs as a LiP, and Mr Geary would have had trouble getting that. You must be a law student. Actually, in IPEC small claims he wouldn’t even have got costs other than time for travel and the hearing itself, up to £90.